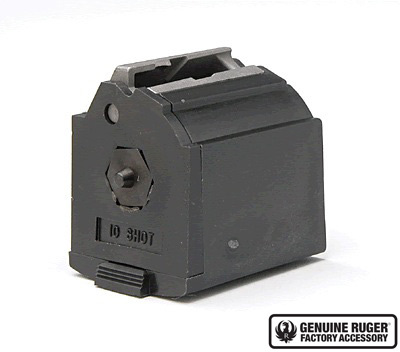 BX-1 10-round, .22 LR caliber magazine is made of black plastic with steel feed and works with any factory original 10/22® Rifle, SR-22® Rifle, 22 Charger™ Pistol and .22 LR Ruger American Rimfire® Rifle. Magazine will function in the .22 LR Ruger 77/22® Rifle, but the contoured base does not match the profile on the bottom of this rifle; the JX-1 Rotary Magazine (#90057) is recommended for this rifle. *Due to changes in the law effective October 1, 2013 Ruger is not able to sell magazines to CONNECTICUT residents. Ruger cannot bill to or ship this magazine to Brooklyn, Buffalo, New York City, or Rochester, New York. DO NOT ORDER THIS PRODUCT, if you live in these cities. I bought the 3 mag setup with the connector that holds them together. After about 200 rounds of Winchester ammo I starting having ejection and feed jams. I thought it was the ammo but it wasnt. It was a weak spring in 2 mags even though they were kept unloaded when not in use, If I only load 6 in them they work ok sometimes.Should last longer than that. works perfect. needed another after I realized how much fun the gun was. I have many of them now and they all work great. Magazines fit my American Rimfire Rifle without a problem. Two will not fit into my 10/22 and 8 are extremely difficult to eject from magazine port. Only two will fall freely from the rifle. Ignore my comments I made earlier on this product. It is a case of users fault - it is usually is. I was at the range last weekend with my 10/22 Takedown. The additional 4 magazines I bought at Ruger Shop online worked flawlessly! No misfeeds even with cheap bulk ammo! I would recommend this product and 10/22 to anyone who enjoys shooting 22s. This magazine is what started the 10/22 line. It is one of the most reliable factory magazines you will ever see. This will not malfunction even when stuffed with mud. Buy several and have fun. This standard 10-rounder works great, and fitting flush with the rifle is a plus- no protruding ends to snag on things. The rotary movement is a neat idea.